Radar outages, a new mowing schedule and runway maintenance likely accounted for an increase in airliners flying low over South Portland neighborhoods, officials said. 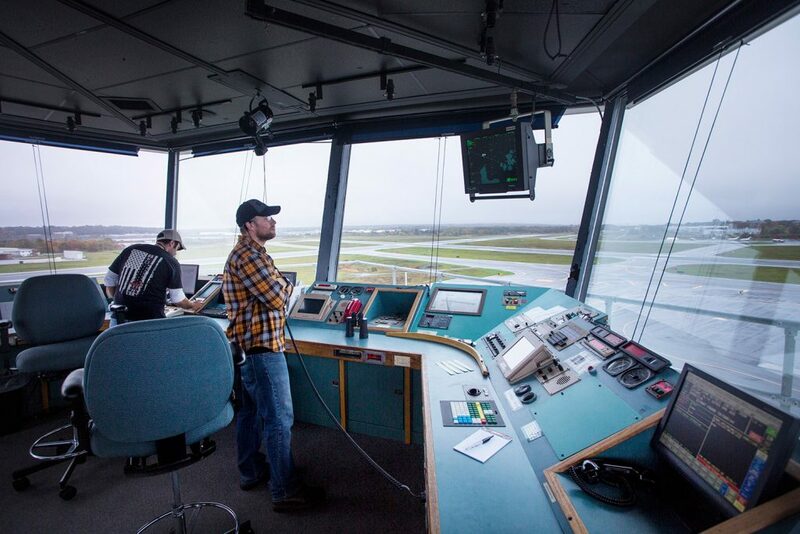 Air traffic controllers Steven Schefcik, left, and Nicholas Doyle work in the control tower at the Portland International Jetport on Thursday. The preferred take-off and landing routes for planes are to the west of the airport. Portland International Jetport and Federal Aviation Administration officials attempted Thursday to clarify the reasons for an increase in airplane noise complaints this summer. 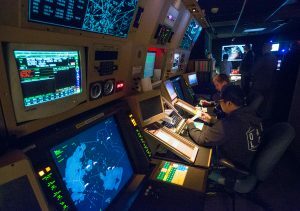 Air traffic controllers Derek Weaver and TIm Teceno, left, work in the radar approach room at the Portland International Jetport on Thursday. More than 20 residents, many from South Portland, packed a small conference room at the airport during a regular meeting of the Jetport Noise Advisory Committee seeking an explanation for an increase in the number of low-flying planes over their neighborhoods and asking officials to do something about it. “This is a serious problem,” said Mary Brett, who lives in the Willard Beach area of South Portland. She said she noticed a huge increase in noisy planes this summer, which at times woke her family early in the morning. “We have lost a night of sleep, we are walking around in a daze,” Brett said. A combination of airport construction, runway maintenance and scheduled radar outages contributed to the problem, according to officials. But residents also suspect some pilots are not using preferred departure and approach routes and are taking shortcuts over densely populated residential areas. Last week, airport Director Paul Bradbury and Noise Advisory Committee member Adrian Dowling said that radar outages may have impacted noise because they kept pilots from approaching the airport from the east over the Fore River using a procedure called harbor visual approach. Mark Collins, air traffic manager at the Portland International Jetport, points to a sectional chart as he explains traffic control procedures. The visual approach is only used during the day and in clear weather. It is the preferred approach for airliners coming in from the east because it is less noisy than using instruments to fly straight in to the main runway over South Portland neighborhoods. The preferred takeoff and landing routes are to the west of the airport. The FAA appeared to contradict that explanation, stating that outages at its radar station in Cumberland did not affect flight patterns or procedures at the airport. The jetport is covered by radar located in Cumberland and Skowhegan, and Manchester, New Hampshire, and North Truro, Massachusetts. But on Thursday, Mark Collins, the air traffic control tower chief for Portland, said that when the Cumberland radar was taken off-line for maintenance this summer, it did prevent pilots from using the harbor visual approach because auxiliary radar sites did not have a direct line of sight into Portland needed for the procedure. The radar work would have affected flights coming into South Portland on five days since May, for five hours a day at most, Collins said. 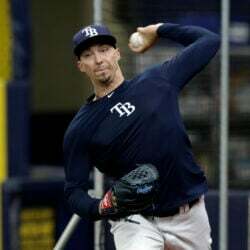 “There is an impact, but it was a total of five days,” Collins said. Construction on a taxi area of the main runway in May and June, a new mowing schedule and scraping and repainting lines on the runway probably had a bigger impact on noise complaints, said Bradbury. 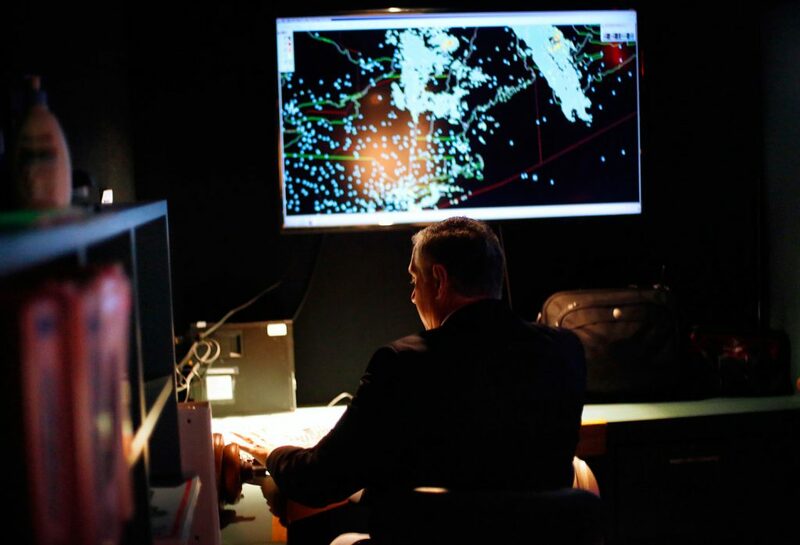 Robert Jones works at a radar screen Thursday in the radar approach room at the Portland International Jetport. The airport is covered by radar in Cumberland, Skowhegan, Manchester, New Hampshire, and North Truro, Massachusetts. There have been 443 noise complaints made to airport management from January through September this year from 102 different people, according to jetport records. That is an increase over the same period last year, when 69 people made 413 complaints. There were 102 complaints in August, the highest of any month this year, followed by 81 in May, 75 in June and 69 in July. Residents at Thursday’s meeting seemed to accept explanations from the jetport and FAA, but several said they didn’t fully account for increased noise. “Mostly everyone is concerned about safety. It also seems like there is a lot of pilot sloppiness,” said Triss Critchfield of South Portland. 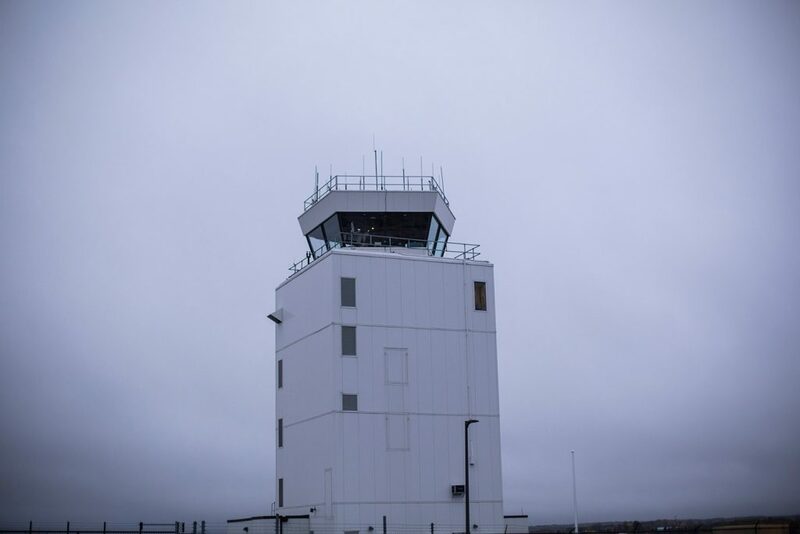 The chief of the control tower at the Portland International Jetport says air traffic controllers have no way to bring pilots in at specific altitudes. Although air traffic controllers give pilots the option to land using the harbor visual approach, they have no way to bring pilots in at a specific altitude, said Collins, the air traffic control chief. Pilots are authorized to choose an approach other than that given by the tower, usually for safety reasons, he said. 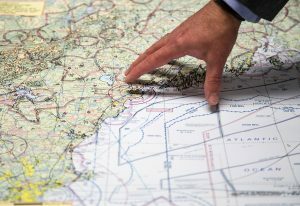 Jetport aircraft tracking maps from the busiest part of the summer appear to show that the vast majority of flights are using approach and departure tracks designed to limit noise, Bradbury said. Katherine Hughes, an employee of Delta Air Lines who sits on the Noise Advisory Committee, said sometimes pilots are unfamiliar with the runway setup or noise abatement procedures. Flight patterns can change for several reasons. Wind direction is primarily what determines the direction in which planes take off and land, but weather, visibility, surrounding air traffic and available runways all factor in. Safety is the primary factor in all airport operations, stressed Mike Foley, a Westbrook City Councilor who chaired the meeting Thursday. “Sometimes these things are done that disturb us, but it is done because of safety,” he said.